If you are a hobbyist, skeleton connoisseur, or just need spare parts to scatter about, consider this Do-It-Yourself Skeleton Mesh Bag Merchandised. Heavy-duty Single Prong Utility Hooks with 90º Tips and broad backplate provide more than enough support for any number of bags of bones. Mesh packaging billboards the product and allows intimate inspection of quality as well as a count of the parts. This Do-It-Yourself Skeleton Mesh Bag Merchandised outfitting seen at Michaels. 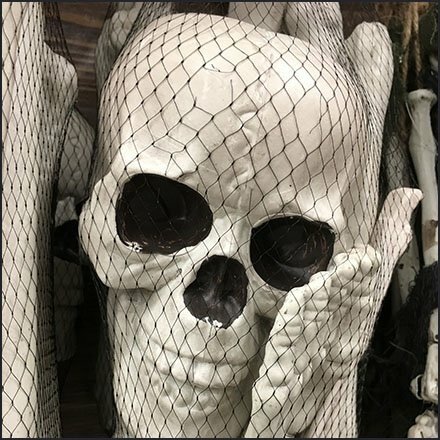 “Skulls in Retail Pinterest Board“ for a visual summary.